Help protect our community and water supply by properly disposing of your unused or expired prescription drugs, over-the-counter products, prescription liquids, pet medications and syringes. 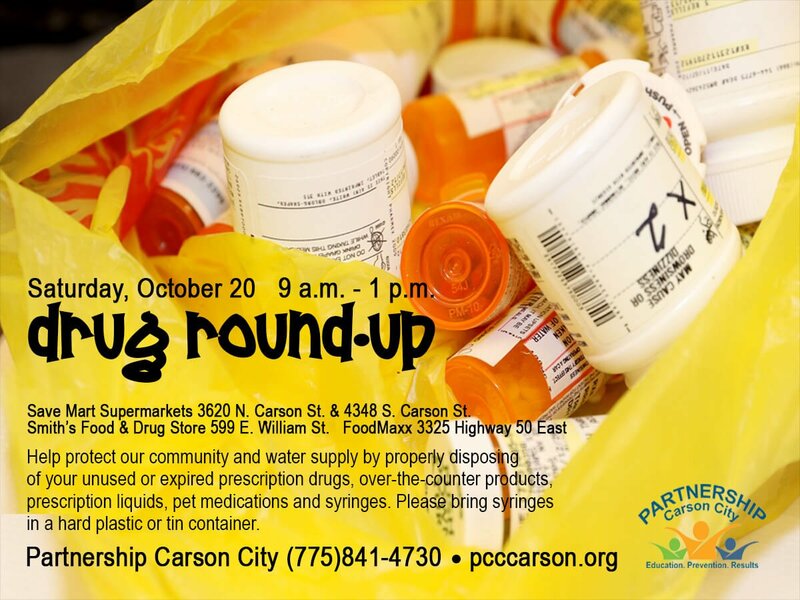 Partnership Carson City will set up drug roundup stations f9 a.m.-1 p.m. Saturday, Oct. 20, in front of both Save Mart Supermarkets, 3620 N. Carson and 4348 S. Carson streets; Smith’s Food & Drug Store, 559 E. William St.; and FoodMaxx, 3325 Highway 50 East. Bring syringes in a sealed, hard plastic or tin container. For more information, call Partnership Carson City at (775) 841-4730 or go to pcccarson.org.